For OWD Platinum: Available USB2 or FireWire 800 Port for streaming off the external HD, or at least 80GB of available HD space. For OWD Gold: DVD drive, at least 40GB of available hard drive space. For OWD Silver: DVD drive, at least 30GB of available hard drive space. To get the most out of Ocean Way Drums, a faster processor will be beneficial, and more RAM will give you much better results. 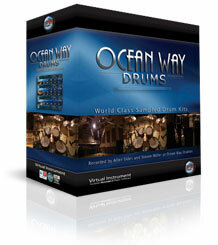 Ocean Way Drums also uses disk streaming technology so faster hard drives will also give you better performance.